The number of disabled people who take part in sport has grown significantly and England Hockey are committed to providing hockey playing opportunities with an emphasis on inclusion and participation. Flyerz Hockey provides opportunities for disabled people to join the hockey family throughout England. In partnership between Sheffield Hockey Club, Rotherham Hockey Club and Access Sports, they have announced South Yorkshire Flyerz. 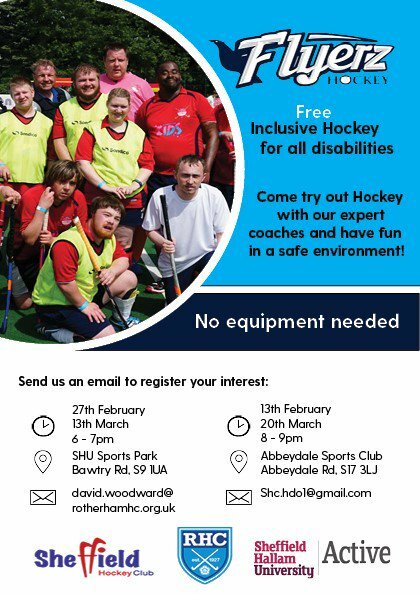 Four sessions will take place in Sheffield, two at Abbeydale Sports Club on 13th February and 20th March (8-9pm) and two at SHU Sports Park on Bawtry Road on 27th February and 13th March (6-7pm).